The GLNF issued a press release on Friday, January 21, 2011, announcing the sudden resignation of the members of the Board of Directors of the fraternity. This is on the heels of a Paris court decision on December 7th, 2010 requiring Grand Master Stifani and the GLNF to convene a General Assembly in the next few weeks to hold a new vote for the position of Grand Master, and to answer to the membership for a series of allegations and complaints against his actions. It is alleged that Stifani was illegally elected to serve a second five year term, in violation of the GLNF's constitutions. 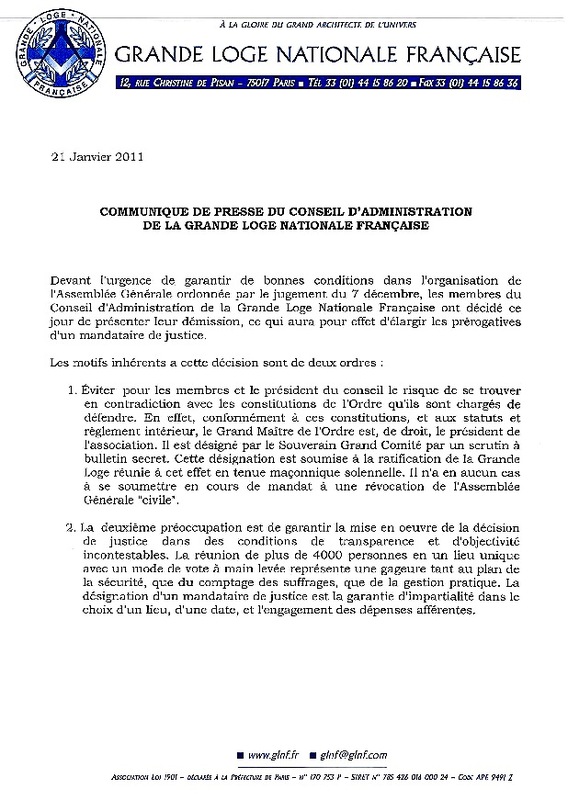 Given the urgency of ensuring good conditions in the organization of the General Assembly ordered by the Judgement of December 7, members of the Board of the Grande Loge Nationale Francaise have decided today to submit their resignation, which will in effect expand the prerogatives of court justice. 1. To avoid for members and the Chairman of the Board conflicts with the constitutions of the order they are asked to defend. Indeed, in accordance with the constitutions and statutes and rules of procedure, the Grand Master of the Order is, by law, the president of the association. He is appointed by the Sovereign Grand Committee by secret ballot. This appointment is subject to ratification of the Grand Lodge convened for that purpose in holding Masonic ceremony. He in no way has to undergo during his term a revocation of the general meeting "civil." The resignations may very well be a ploy to buy more time. In fact, Stifani clarified last week if he resigned as President of the Board, that did not mean his resignation as Grand Master. A date for the new Assembly has still not been set. Meanwhile, on January 19th, dignitaries from nine other grand lodges at work in France met in Paris under the banner of La Maconnerie Francaise. The GLNF was pointedly not involved in the meeting. Collectively representing 120,000 male and female Masons, they gathered as a show of cooperation with each other, in the face of embarrassment from public stories over the GLNF's problems. One undercurrent flowing through French Masonry is the longstanding desire of the regular Grand Loge de France to again be recognized in the mainstream world, as it was for decades. The GLNF was formed with the blessing of the United Grand Lodge of England, and eventually gained exclusive recognition by most regular grand lodges worldwide because of that association. If the GLNF continues down the path it is pursuing, the GLdF might very well have a chance again. The country's largest grand lodge, the Grand Orient de France, voted last year to admit women into its lodges. That leaves the GLNF and the GLdF as the two largest male-only obediences in France. Both GLs should be reaping the benefits of men leaving the Grand Orient in protest. But with the high visibility of turmoil in the GLNF, the GLdF may have its day in the limelight sooner than anyone ever thought.